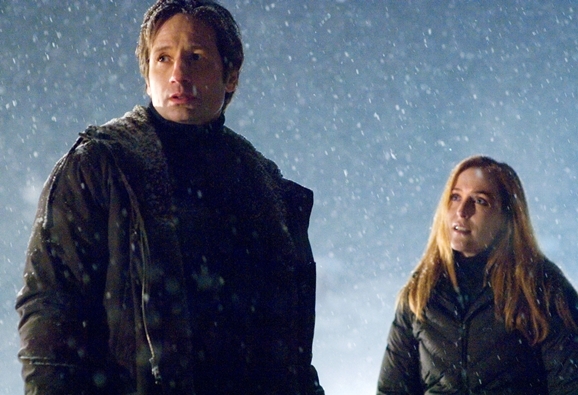 Rumors Still Floating For Third X-Files Movie, But Will It Ever Actually Get Made? Despite his many successes, it’s almost unbelievable just how lacking Chris Carter’s career has been in the last decade. 2008’s The X-Files: I Want to Believe is his only major credit during that time, and it left a sour taste in many people’s mouths. It seems impossible that a really great X-Files movie won’t be made, so long as Carter sticks to what actually made the franchise exciting in the first place. And while he’d made reference to a third film, one that may possibly feature the alien invasion the TV series hinted at, so far it’s all just been talk. Well, here’s some more talk to fuel that fire. Speaking to Moviehole.com, executive producer Frank Spotnitz and star Gillian Anderson hint at a third X-Files film, without really saying anything new. Spotnitz has long answered questions about another sequel with the phrase “Don’t Give Up,” used heavily in the second film. “It took six years after the end of the TV series to get the last movie made. I hope it won’t be another six years before the next one gets released, but I’ll wait however long it takes,” said Spotnitz, probably in his most non-committal tone. “The last thing I heard from Chris was that he was in the process of writing the script,” said Anderson. “As exciting as that sounds, and it is exciting, the script is the first of 10 million steps. And also, script writing in itself is a dubious process…fingers crossed, he will turn one out that Fox wants to throw millions of dollars into making.” I’m not sure that throwing money at something is any measurement of quality assurance, but I’d be willing to bet on a budget focused more on spaceships than psychic molester priests.